Hearty duck and port ragu is a hearty comforting one pot wonder. 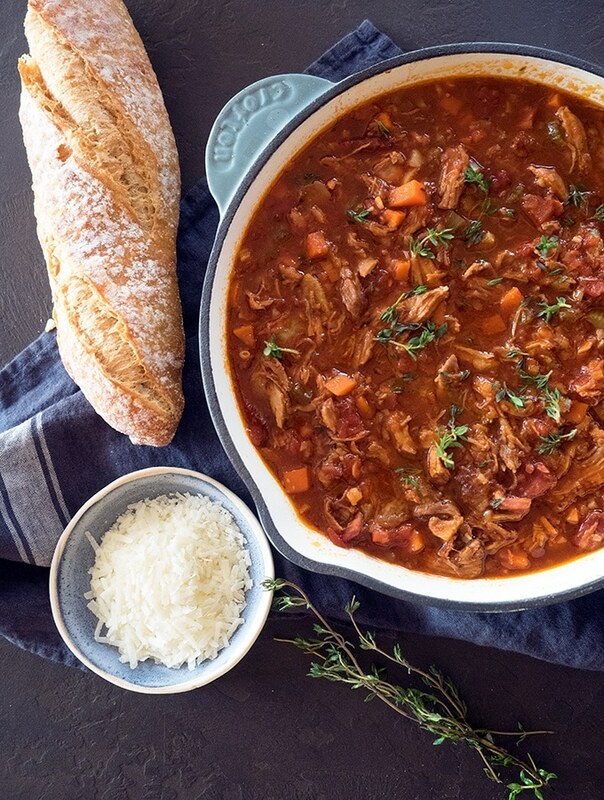 Comforting and delicious, it’s perfect for those cold winter weekends. A slow cooked ragu of any description is a very versatile staple to have on hand. I’m into big batch ragu cooking, which allows me to freeze some for later. There is enough for dinner on the day of cooking, and then a serve or two frozen for later use. 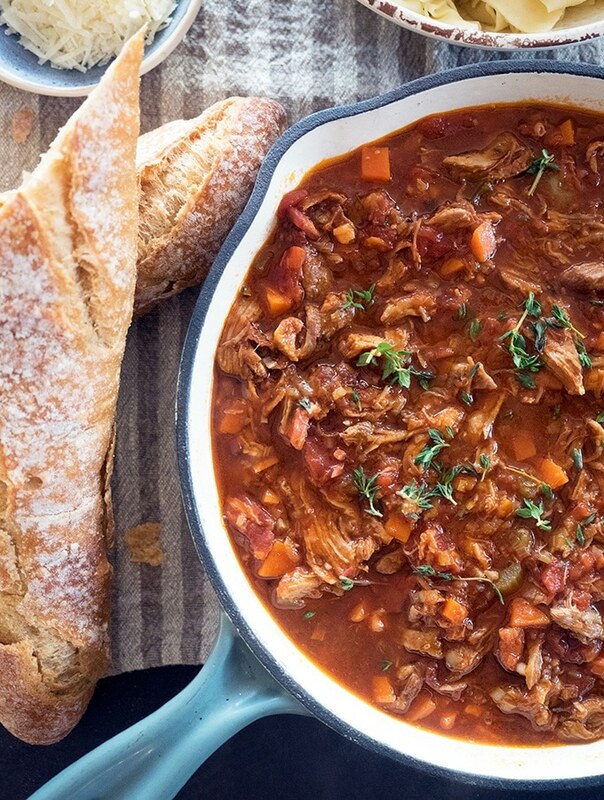 My hearty duck and pork ragu recipe will stretch to feed a family of four for two meals. Or perfect for that winter dinner party. What I find so versatile with having a stash of ragu in my freezer, it makes for an easy meal base. I use ragu to fill omelettes, crepes, make lasagne or cannelloni, and it is the perfect pasta sauce. It can also be used to fill jaffles, place some in an ovenproof dish and crack a few eggs in and bake, or use to top baked potatoes or a spoonful or two on some buttered toast (easy Sunday night in). Now I have given you some alternative ragu ideas, let’s talk about this hearty duck and pork ragu. Port may seem an unusual ingredient, but it adds a lovely depth of flavour and hint of sweetness. It’s an intriguing alternative to using a red wine and a conversation starter. Duck is the main ingredient. Do yourself a favour and buy a whole duck. My step by step guide will walk you through how to break one down. You then could make your own duck stock for the ragu as well. This is a rich and hearty duck and port ragu, slow cooked and packed with flavour. Rich due to the duck being cooked skin on, but removed when the duck is shredded. Then there is the added flavour side punch of the pancetta. Add to this the richness of port for a hearty ragu. I served this ragu simply with some pappardelle and a generous handful of grated parmesan. A shallow heavy based casserole dish with a lid is a must for this recipe. Port: I used a tawny port, which has a sweet note when cooking. Make sure to taste and season. 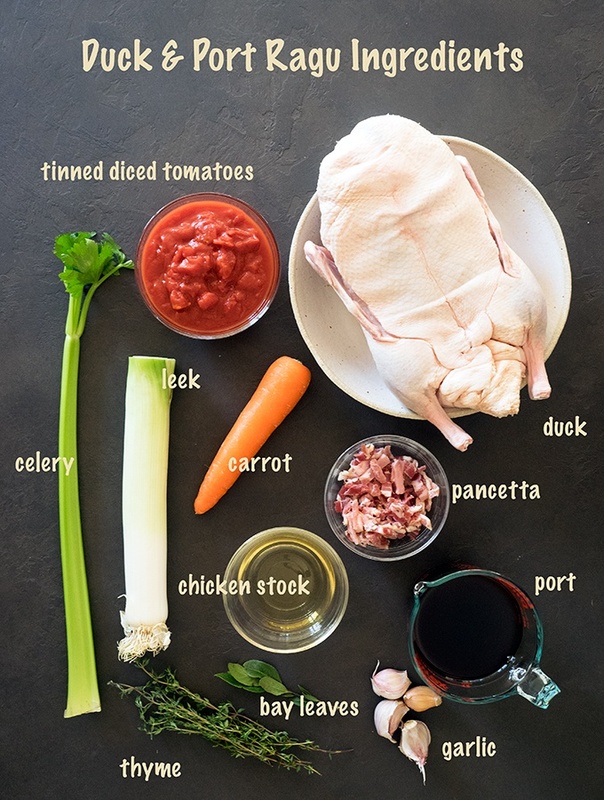 If you find the port is really on the sweet side (they vary), then add a couple of tablespoons of tomato paste to the hearty duck and port ragu during cooking. Pancetta: Pancetta is a rolled Italian style bacon, which is salt cured with pepper. Can’t find pancetta? Next suggestion is to use prosciutto, and if you can’t get your hands on that, normal run of the mill bacon. If you haven’t already invested in some good quality freezer to oven glass lidded storage containers, then do. 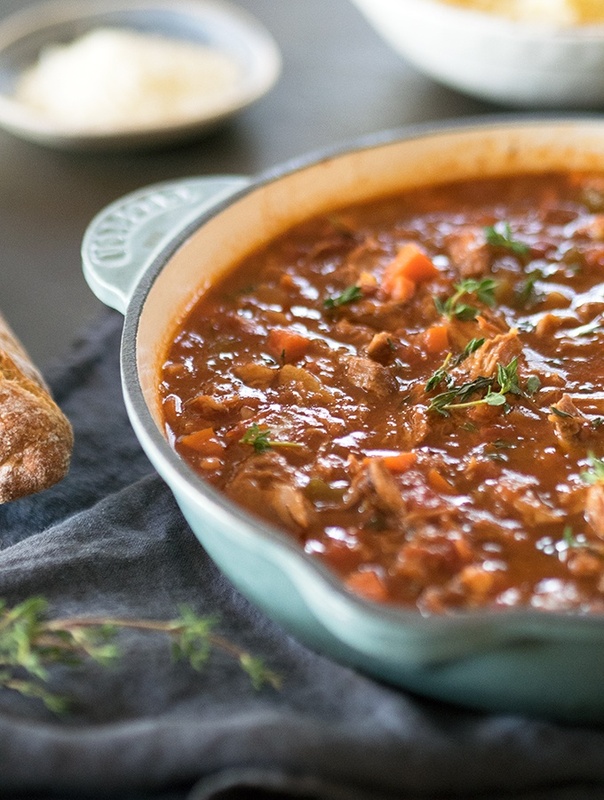 Freeze any leftover hearty duck and port ragu for later use. Use some of my suggestions above, it really is versatile to have on hand. Hearty duck and port ragu is a hearty comforting one pot wonder. 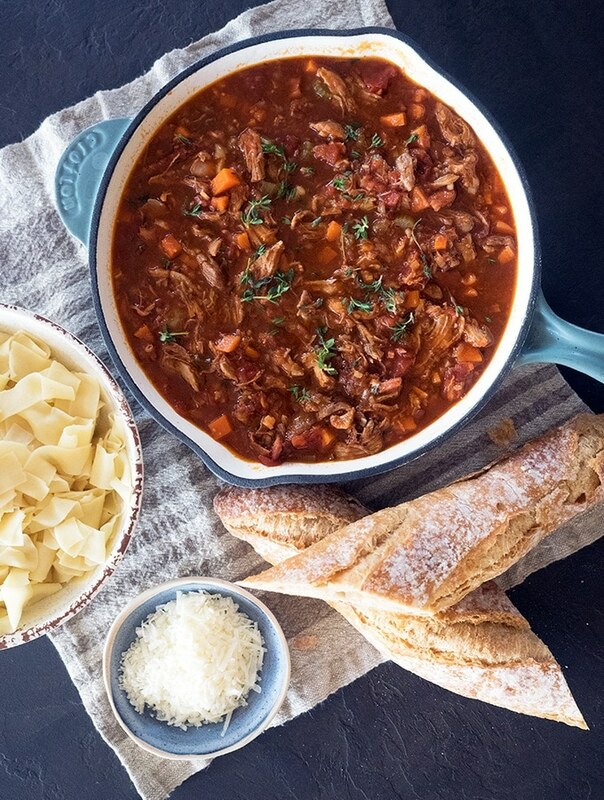 Comforting and delicious, it's perfect for those cold winter weekends. Heat large heavy based casserole pan (that has a lid) over a medium heat. Season duck pieces with salt and pepper. Place them in the saucepan skin side down. Cook duck until well browned on either side. Remove all but 1 tablespoon of duck fat from the saucepan. Place saucepan back on the heat and add pancetta, leek, carrot and celery. Cook for 5 minutes or until the mixture starts to caramelise (go brown). Add tomatoes, vinegar, garlic, bay leaves and thyme. Mix well. Add port and stock, mix well. Return duck pieces and any released juices to the saucepan. Bring mixture to a hard simmer and cover with the lid. Leave to simmer on the stove top for 1 hour 30 minutes, or until the duck is tender. Stir the mixture occasionally while it is cooking. Once the duck is tender remove saucepan from the heat. Remove duck from the casserole pan and leave to cool. Once it is cool enough to handle remove the skin and discard. Then using a fork shred the meat from the bones, discard the bones. Return pan to medium heat and return the duck meat to the pan. Simmer for a few minutes, stirring while it does, until the sauce has reduced slightly and thickened. Serve duck and port ragu with creamy polenta or pasta. You will need a large heavy based saucepan that has a tight fitting lid for this recipe. Looking so good and delicious. Thumbs up for this duck and Port Ragu recipe. I am not a big fan of ducks but this looks something worthy to try. Thank you for sharing this recipe. Will have this on Saturday. This ragu looks amazing and I love how you laid out all of the ingredients needed. I love dinners like this – one pot but one pot full of SO much flavor! I need to cook with duck more, thank you for the inspiration! That is one gorgeous looking ragu! I have never worked with duck before but I’ve been wanting to try it! This recipe is a great excuse to give it a shot! It’s such a flavorful, wonderful meat, and then making it into a sauce and serving over pasta is a fantastic idea! So much flavour in this dish! This looks amazing! Great photos too!